Runners on the line hold their breath. 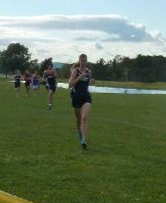 Every Tuesday, we followed the Abington Heights Cross Country team from course to course. We witnessed the start, then criss-crossed the grounds to get a glimpse of our daughter and her teammates as they found their stride up hills and down, through the woods, and finally on to the finish line. Junior High ran 1.86 miles, Varsity 3.1. They ran hard. We cheered them all on, to the last runner in! Records of competitive foot racing date back to 1829 BC with the Tailteann Games in Ireland. The first recorded Olympic Games took place in Olympia, Greece in 776 BC. There's something about the competition that's ageless. Who knows? Maybe Cain and Abel had their own races. Life is a little like a cross country race. It's important to get a good start, to stay steady through the ups and downs, and then to finish well. We need people to coach us along the way, and there's comfort in a trusted teammate's encouragement now and then. but only one gets the prize? looking unto Jesus, the author and finisher of our faith . . . I'll never compete in a foot race again. But I'm going for the crown that will last forever. I want to run the race of life well. Even when the course gets muddy and slippery with uncertainty or I face multiple uphill challenges or I lose my way in the woods of difficulty. I'm grateful for coaches who give me tips on how to improve my race and others in my life who cheer me on. May all of us run the race of life with endurance and grace. Good season, Abington Heights. And special congratulations to you, Elisabeth. You worked hard and did a great job. Dad and I are Comet proud!! As always your images and story touch my heart. Love the phrase . . .Comet proud. Thank you for sharing your story which relates to my own faith run. Another great piece, Sarah. Makes me feel as though I'm right out there with the Comets...By the way, I'm willing to bet you'll run the footrace of a lifetime--right into His arms one day. Thanks for cheering me on in so many areas, Sherry! Excellent, Sarah! You capture the race, both for Elisabeth and Abington Heights and for all of us as we run the race into eternity for the crown that will last forever !! Love the post! Believe it or not, the 1st Corinthians passage was read at the start of the Steamtown marathon and was accompanied by a prayer! I'm glad to see Elisabeth liked XC so much!